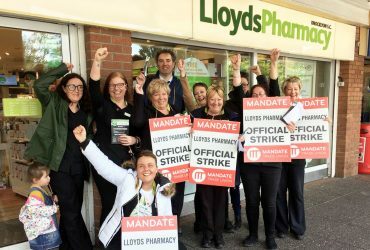 Mandate Trade Union members employed by Lloyds Pharmacy have today (Tuesday, 25th September) voted by 75 percent in favour of temporarily suspending industrial action. The decision was taken at a mass meeting of members which took place in Citywest Hotel today. The workers said the reckless and disgraceful behaviour of their employer, who who has refused to engage with their workers’ union, has inconvenienced the public and damaged the business. “We care about our customers. We hate seeing them inconvenienced. We only wish that management felt the same,” said one Lloyds worker who wished to remain anonymous. “It seems the company would rather close shops, inconvenience the public and damage the business rather than allow us our right to representation,” she continued. 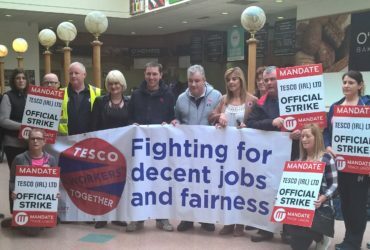 Mandate said the company had “targeted” a number of trade union activists in order to create a chill effect. 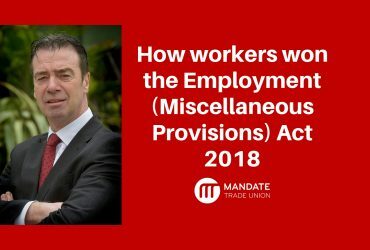 The Labour Court has already issued a recommendation instructing Lloyds Pharmacy to allow their workers the right to be represented, however, the company has refused to engage. Now Mandate will seek a recommendation on the substantive issues in dispute. Improvements in annual leave entitlements and public holiday premiums. LloydsPharmacy is Ireland’s largest pharmaceutical chain operating 88 stores across the country with approximately 800 workers employed in their pharmacies. LloydsPharmacy is owned by the McKesson Corporation which is the largest pharmaceutical company in the world with revenues of €183.88 billion in 2017 – more than double the revenue of the Irish state. McKesson also own UDG Healthcare (formerly United Drug) which is headquartered in Ireland, and where the workers are afforded their right to trade union representation (SIPTU and Unite represent staff in Ireland). Lloyds Pharmacy argues it does not operate zero hour contracts despite Mandate publishing a number of the contracts. A number of employment experts have also stated that the contracts do not guarantee any hours of employment for workers.